The AutoAqua Smart Security System Combo consists of three separate penny sized optical sensors set to safeguard your aquarium against common malfunctions. Each Sensor is pre-programmed and magnetically couples for easy installation. The AutoAqua Smart Temp Security uses a tiny temperature sensor to secure the aquariums temperature. The magnetically-coupled sensor makes it so easy to install. This unit features a Plug&Play design, with no settings needed. Secures your aquarium temperature ranging from 72℉ (± 0.5℉) to 84℉ (± 0.5℉). 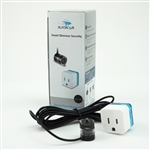 Featuring a plug and play design, AutoAqua Smart Level Security automatically detects the water level status when mounted. Magnetically-coupled sensor makes it easy to adjust to the desired level to secure your aquarium.